Food to Grow - NOW AVAILABLE! Frankie's brand new best selling book "Food to Grow", is now available in stores. 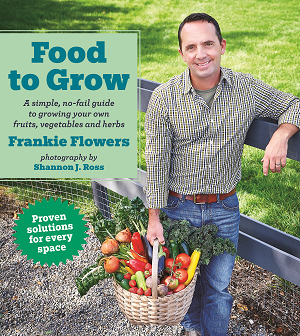 This book supports Frankie's mission for 2016 to get as many people as possible to grow something they can eat. Come see Frankie at one of the many events across Ontario in 2016 to support his new book and his mission. From Canada’s #1 gardening team, a guide that makes growing your own fruits, vegetables and herbs simple, bountiful and fun! Food to Grow in stores now including Chapters - Indigo (online and in store) and Costco (in store only). Nothing beats the taste and smell of a tomato freshly picked from your own garden. And there’s a certain pride in knowing that the salad you just served—fresh strawberries and all—was harvested entirely from your backyard. But growing your own fruits, vegetables and herbs can be time-consuming and feel overwhelmingly complicated. Your eagerness to get growing in the spring can be rained out by seemingly endless seedlings and seed packs at your garden centre, all with cryptic planting instructions that leave you with withered plants rather than crunchy carrots. But it doesn’t need to be that way! Frankie Flowers has decades of experience helping thumbs of all colours turn barren patches and empty pots into bountiful harvests—and he can help you do the same. Food to Grow simplifies every growing decision you’ll need to make. Frankie helps you evaluate your space, decide just how much time you want to invest and then make the smartest choices about which plants will give you the best bang for your buck. He guides you through the entire growing season from prepping and planning, to planting, weeding and harvesting (the best part! ), and shares not just which veggies, fruits and herbs have become Frankie’s Favourites, but which plants just aren’t worth the effort. Loaded with gorgeous photography that will have you desperate to get digging, Food to Grow includes a detailed A-Z index of over 50 of North America's most popular home crops. Whether you have space for a few pots or 40 acres out back, Frankie Flowers will help you make your dream of home-grown treats a fun and tasty reality.